The Independence was built for American Export Lines of New York, at the Bethlehem Steel Company's shipyard in Quincy, Massachusetts, intended for use as a trans-Atlantic passenger liner. Built in 1951, in the years after World War II, she adhered to U.S. Navy specifications that would permit rapid conversion into a troop ship, with the capacity for 5,000 men and their equipment. She was built entirely of non-combustible or fire-resistant materials, equipped with extra hull plating, and outfitted with two engine rooms so that if one were damaged, the other could keep the ship moving at a relatively high speed. Among the finest passenger vessels ever built in the United States, the Independence features a traditional exterior profile, yet the interior has modern amenities. She was the first U.S. ship to feature fully air-conditioned passenger and crew cabins. Renowned industrial designer Henry Dreyfuss shaped the layout of the ship, originally designing it to carry 1,000 passengers. Hence, cabins and public spaces remain roomy. There is an abundance of open deck space, especially on the tiered aft section, for guests to enjoy scenic views. In the 1950s, as the ship sailed the "Sun Lane" route between New York and the Mediterranean, the passenger list was highlighted by celebrities. When the airplane emerged as the new mode of trans-Atlantic transportation in the early 1960s, the Independence was placed in the Caribbean, competiting in the vacation cruise market. 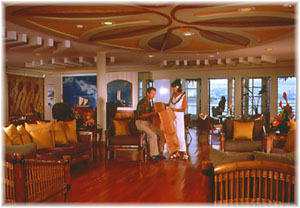 In 1968, the ship was refurbished and repainted with a sunburst mural and Jean Harlow eyes above water level. The new look did not go over well; six months later, the hull was repainted white. By the end of 1968, the ship was laid up, signaling the end of its service for American Export Lines. Chinese shipping magnate C.Y. Tung acquired the ship in 1974, planning to return it to service, but skyrocketing oil prices kept it laid up in Baltimore. In 1978, a group of American investors began laying plans for the resumption of passenger service under the American flag. 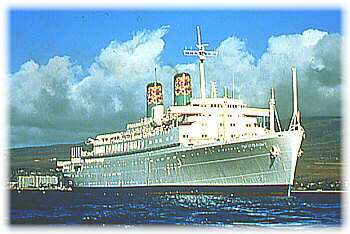 Thus was American Hawaii Cruises born, a wholly American-owned and American-operated company. After a refurbishment that included the addition of bow thrusters to facilitate easier maneuvering in the Hawaii's small harbors, the Independence re-entered service on June 21, 1980. The Delta Queen Steamboat Co. In 1993, American Hawaii Cruises was acquired by The Delta Queen Steamboat Co., the oldest U.S. flag cruise line and the only operator of authentic, steam-powered overnight paddlewheelers. In May 1994, the parent company name was changed to American Classic Voyages Co., which is traded on the NASDAQ National Market System under the symbol AMCV. The new owner set out to reposition American Hawaii Cruises as a Hawaiian company, offering in-depth experiences of the islands' beauty and culture. 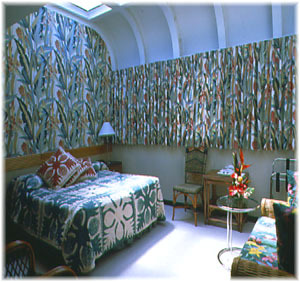 The Independence was refurbished in November 1994 to reflect a more Hawaiian ambiance, and again in 1997. In 1997, the S.S. Independence received $13 million in improvements/renovations. The most visible work was done to enhance the passenger experience. In addition, 25 passenger cabins were added, bringing the total to 446. 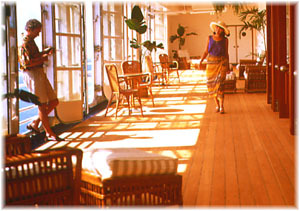 The ship's main entry boasts a new marble floor, and new wall-covering and carpet were installed in passenger corridors. Both swimming pools were retiled. Seating in the "Hoi Hoi Showplace" was increased and reconfigured to enhance sightlines. Also, several enhancements to safety and emergency systems were completed in advance of a federally mandated 1998 deadline. The S.S. Independence is the only oceanliner in the world to sail the waters of Hawaii year-round. Her 7-night cruises visit 5 ports on 4 spectacular islands- Oahu, Maui, Kauai and the Big Island. American Hawaii Cruises now offers "sample-size" cruises, which are three- and four-night segments of the seven-night itinerary. Tonnage: 20,221 GRT; Crew: 317; Lenght: 682 feet; Propulsion: 37,000 horsepower with four steam turbines, 17 knots cruising; Passenger decks: nine; Cabins: total 446, 37 suites, 240 inside, 169 outside.